Printing at only 17 pages per minute, this five function MFC hits in some areas and misses in others. On one hand, the device comes equipped with a very high print resolution but, on the other, the copy and scan features of the device are very limited. This discontinued model from Brother, the Brother MFC-8820D, is certainly a mixed bad, but worth taking a look at. Utilizing electrophotographic laser technology, the Brother MFC-8820D uses toner very efficiently, but operates at a very slow print speed. It includes no network card but comes complete with both a USB 2.0 port and a Parallel port. Its paper input capacity is decent, and expandable. A 250 sheet standard paper tray for use with letter, legal, and other normal paper types is complemented by an additional 50 sheet multipurpose tray. The multipurpose tray can be used simply for additional paper storage, or for the automated loading of multiple sheets of special media including transparencies, card stock, company letterhead, and envelopes. An additional paper tray with room for 250 sheets is available for purchase separately and allows for up to three media types to be loaded at once. 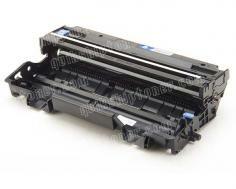 Output capacity is locked at a solid 150 sheets. Regardless of the Brother MFC-8820D's print speed, there is one feature about it that really stands out, and this is its ability to duplex copy. Copy resolution is very low, but the fact that this device can automatically make two sided reproductions is rare, and can be a great asset for businesses that require the ability to combine input onto double sided output. The 50 page automatic document feeder is also a great help for working with multiple copies, scans, or faxes all at once. 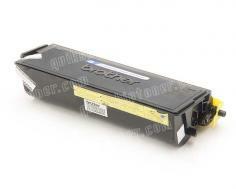 The Brother MFC-8820D's fax modem has a decent operation speed of 33.6 Kbps, though it is not of the Super G3 type, and will therefore transmit at a rate of approximately 3 seconds per page. 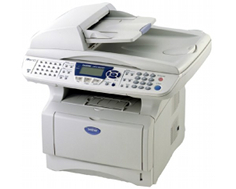 Some fax features included are one touch dialing, auto dialing, and 360 location broadcasting. Though print resolution runs very high for the Brother MFC-8820D, at 2400 x 600 dots per inch, copy resolution falls behind drastically at only 600 x 600 dots per inch. This means that copies are limited to a 600 dpi maximum, and copies of imagery will potentially suffer in appearance. The optical scanner is capable of 600 x 2400 dots per inch, which means the hardware is perfectly capable of copying at this quality, but Brother chose to exclude this option in the interest of copy speed, which is slow anyway at only 17 copies per minute. Review it: "Brother MFC-8820D "
With high yield toner cartridges available for the Brother MFC-8820D, replacement cycles will remain long and up to 6,500 pages can be printed from each unit. The drum unit which distributed the toner is capable of up to 20,000 pages at 5% coverage and will therefore only have to be swapped out a few times over the life of the printer.